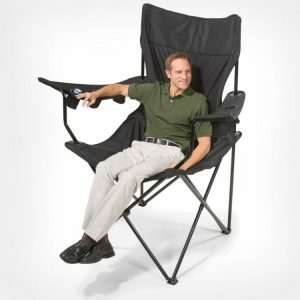 Enjoy the laidback life when you’re lounging on the best folding lawn chair! Here are our picks and our tips in choosing yours. The beauty of the best folding lawn chair lies in its versatile uses. Aside from its use as a piece of outdoor furniture, particularly on your front lawn or backyard, it can also be used for other outdoor uses. Think about using it during picnics in the park, on camping trips to the woods, and even when watching sports games, among others, and you will agree that it’s a great purchase! But what makes for the best folding outdoor chair? Keep in mind that it should be durable enough to withstand exposure to the elements for more than a few years, versatile enough to be used for several purposes, and portable enough to be used virtually anywhere. The GCI Outdoor FirePit is the best folding lawn chair in our opinion because it combines the benefits of a lawn chair and a rocking chair in one! Just place it on a flat, even and stable surface, open it to its full design, and rock away whether you’re on a beach, a park, or a camping ground. Since it can easily fold flat, thanks to its Eazy-Fold Technology, its carry handle and its lightweight, it can be stowed in the trunk for ease transport or in a corner for storage. With its padded arm rests and mesh backrest, it’s a comfortable chair to be in for prolonged periods. 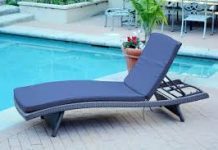 We think that it’s a great lawn chair because it meets the criteria for durability, versatility, and portability, thus, it gives great value for the money. We like it, too, because it’s one of the few outdoor chairs that have a rocking motion, a feature that mothers with fussy babies will appreciate while outdoors; the rocking motion can put babies to sleep faster. 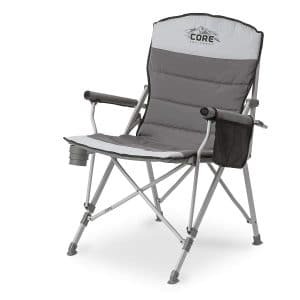 The Core Equipment chair is also the best folding lawn chair because it’s so well-designed, from its base to its armrests and backrest. With its sturdy steel frame, it can accommodate a heavier person even when he’s putting his full weight into it. The metal can last for several years even with regular use and exposure to the natural elements; proper care and maintenance is a must for longevity.The seat and back are also padded for extra comfort and protection against mosquito bites on your back and underside. 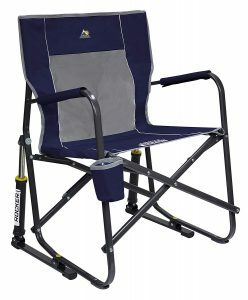 We have to say that it’s a great lawn chair that can also serve as a picnic and camping chair. While it isn’t as elegant in appearance as the GCI chair, we think that it more than makes up for in thoughtful details, such as in the cup holder, the padded fill, and the solid armrests. The Timber Ridge chair is also the good folding lawn chair because of its affordable price – it’s our recommended budget pick –and its quality features. The combination of polyester for the seat and aluminum for the frame makes it a strong and sturdy chair that can be used for multiple purposes over a few years. The polyester material makes it easy to clean, a must if it’s used frequently in outdoor situations; stains from grass, trees and food can become stubborn when these aren’t removed promptly. While it’s an affordable chair, it doesn’t skimp on the relatively high-quality details either – and that’s what made us consider this Timber Ridge product a good lawn chair. When we sat down on it, we felt immediately at ease, thanks to the padded seat and head, the nice high back, and the sturdy legs. We may not feel like it’s a throne but it can be when you’re outdoors and the other alternative is the cold, hard ground, perhaps even muddy. The Quik Shade chair is true to its name! It quickly clicks into its open position with a single motion and then it’s securely held in place with a tension rod. Its umbrella provides ample shade and adjusts depending on your desired angle (i..e, raised, lowered, or tilted). It’s the type of lawn chair that can be used rain or shine, literally. 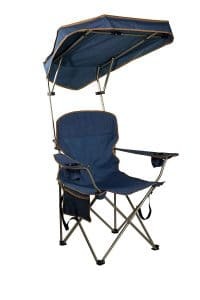 Yet another lawn chair with an adjustable canopy is this Quik Shade chair, a larger version of the abovementioned product. The canopy can also be adjusted at different angles so you’re always protected from the sun’s rays, even a light rain. 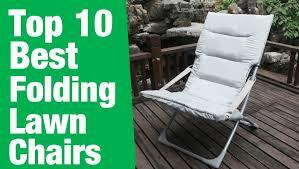 This can also be folded down so that you can catch the sun’s rays, too; it’s folded behind the chair. 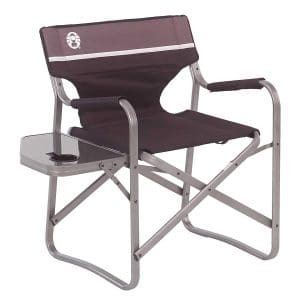 With its larger size, it’s a more suitable choice for people who want a more spacious lawn or camping chair. We’ve seen an adult and a child use it at the same time, too. 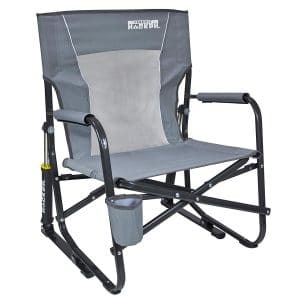 Unlike many lawn chairs, this Coleman chair has a side table that can be used for multiple uses. The side table can be obviously used for keeping your food and drink, phone and books, and other small personal items within easy reach; it also has an integrated cup holder so there’s more space for other items on the table. The chair and side table are designed as an integrated unit so there’s no chance for misplacing the latter. This GCI Outdoor Freestyle chair is a lawn chair and rocking chair in one product and, thus, it gives good value for the money, especially for quality-conscious consumers. When used as a rocking chair, it has smooth back-and-forth movements that can be enjoyed on relatively flat outdoor surfaces. When it’s used as a typical chair, it’s stable enough to accommodate a large and heavy person weighing up to 250 pounds. This Kijaro chair provides optimum comfort in outdoor situations due to its thickly padded seat and headrest, which allow its user to take brief naps or sunbathe. The seat doesn’t sag significantly even when its weight capacity is being tested to the max while its dual lock technology ensures that it stays in a secure position. There are also convenient storage features, such as the mesh pocket, zipped organizer, and cell phone holder, as well as a carry strap for ease of transport once folded. 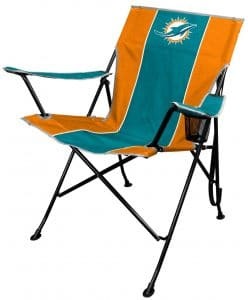 Fans of football will likely love the NFL TLG8 folding chair because it’s yet another symbol of their team loyalty. 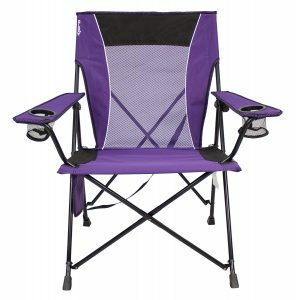 Plus, it’s available in all team colors so every fan can have his or her own chair at the park, campground, or lawn. The foldable design makes it easy as well to bring it virtually anywhere a game is played or broadcasted. 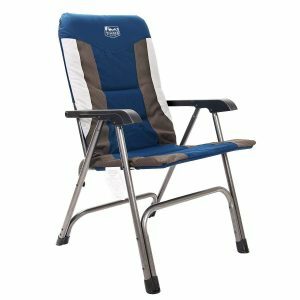 This Coleman chair is unique among the lawn chairs in our list because it comes with a 4-can cooler that keeps your cold beer within easy reach. The cooler also serves as a built-in armrest so it’s a compact design. There are also a mesh cup holder for keeping another drink and a spacious storage pocket for keeping a few personal items within reach, too. 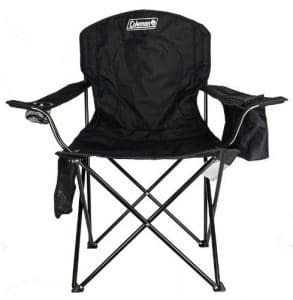 Keep in mind that the best folding lawn chair should satisfy your specific needs and wants in it. 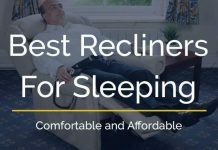 For example, you may prefer a more affordable lawn chair even if it means sacrificing on a few basic amenities, such as a side table. You may, on the other hand, choose a more expensive chair because of the extra features, such as a sturdier frame, a canopy, and a spacious organizer/holder. 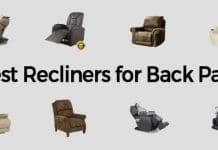 When considering the lawn chairs for sale in stores, we suggest keeping these important factors in mind. This way, you will be able to get one that will meet your personal criteria in terms of cost, weight and features, among others. If possible, avoid looking at the cost of the chairs first when making product comparisons. Remember that, in most cases, higher quality means higher price, and you may be willing to pay for it especially when you’re a value-conscious consumer. You may, nonetheless, want to stay within a budget so be sure to factor in the chair’s price when considering whether to buy it or not. The idea behind folding lawn chairs is their portability, a feature that means these can be easily transported nearly everywhere it’s needed. 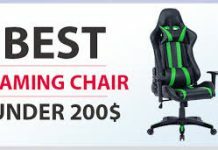 Your best choice then is a lightweight chair that weighs about 9 pounds or less. 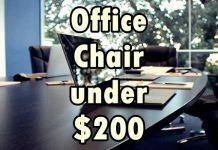 You should keep in mind, however, that you probably should be suspicious of a too light chair since it may not be sturdy enough.The chair should also have a fairly high weight capacity, preferably about 300 pounds. But don’t dismiss a chair with, say, a 225-pound or a 250-pound capacity either – you have to consider who will frequently use it and decide whether it’s a good choice or not. The size is also a matter of getting the right balance – too large and it won’t fit into your car’s trunk when folded, too small and you likely won’t fit into it either. 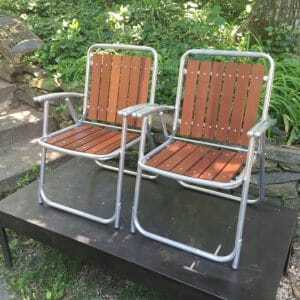 You have to consider both the open (i.e., assembled) and closed (i.e., folded) dimensions when making comparisons between two or more lawn chairs. The frame should be easy to open and close so the chair is easy to set up and fold for storage and transport. Be sure to consider the material used for the frame, too, with metal being the more weather-resistant and wood being the more appealing in terms of aesthetics. Of course, check that the frame can actually carry the weight of an adult person and will remain stable in outdoor environments. The materials used for the seat should be just as sturdy as the frame materials. The more common material is polyester but there are also other materials like mesh and plastic. Check that the seams on the polyester are well-stitched to avoid premature tears on the seat. The frame should also have an excellent welding job, if applicable. Look for extra features that will make the lawn chair more useful. 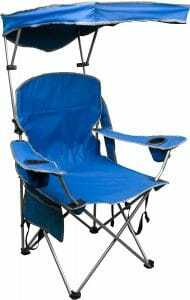 These include storage pockets; cup holders; adjustable canopy, seat and armrests; and a cooler. A note about the seat height: If you want to be in a position of complete relaxation, then look for a lawn chair with legs closer to the ground. If you’re the type who sits and stands on a more frequent basis, then a chair with higher legs is a better choice. 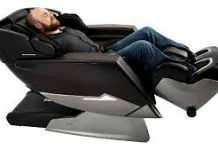 Obviously, the chair should be easy to set up and fold. When you have the best folding lawn chair, you have a great piece of furniture on which you can sit back, relax and enjoy life! You can bring it anywhere your family and friends are gathered and where you want the best seat in the house, so to speak. You will also find that it can be your throne of sorts where you can savor the simple pleasures of love, laughter, and life.